Just finished a piece for an invitational show entitled Rituals. An exchange between friends. A handshake. A kiss before bedtime. The artist at work. 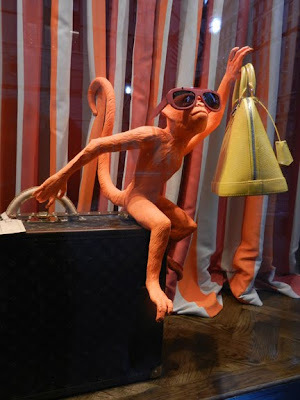 A sun salutation. The wave before boarding the school bus. A song, a word, a meditation. A habit, a custom. The traditional toast at a gathering. A rite of passage. The sacred moments of the ordinary. It's been an interesting challenge. The format is very different than what most people work in: vertical 24" x 60". Nothing is more intimate than our toothbrush. Each day, upon its start and end, we brush our teeth. 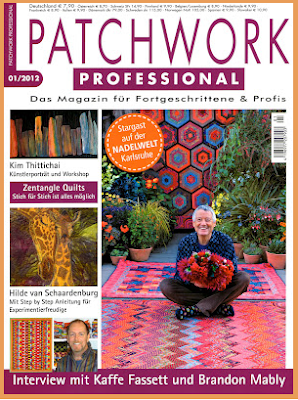 I was contacted by Dorothee Crane, editor in chief of Patchwork Professional, a German magazine devoted to art quilts and interesting textile work. She's asked to do an article on my floral and body imaging pieces that will probably come out in May. This is so exciting for me--I've had little European exposure, so I'm hoping that this article may stimulate interest in my work there. 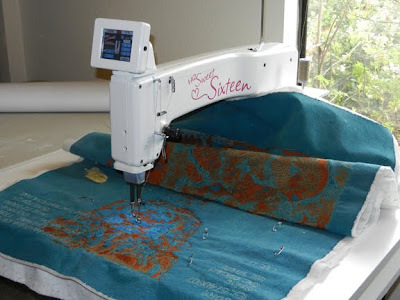 I purchased a Sweet Sixteen made by Handi Quilter last summer. It has become my favorite machine for free motion stitching, allowing me to use really thin threads as monofilament to heavy 30 weight threads as Superior's So Fine 30, and topstitching threads--even DMC crochet threads! Well, I've been asked to help beta test a new Handi Quilter Sweet Sixteen machine that they plan to put on the market next fall at Market. I'll also get to see the factory and meet some of the people in the company along with others that are testing the machine. It should be really interesting. I look forward to the experience, having never done anything like this before. 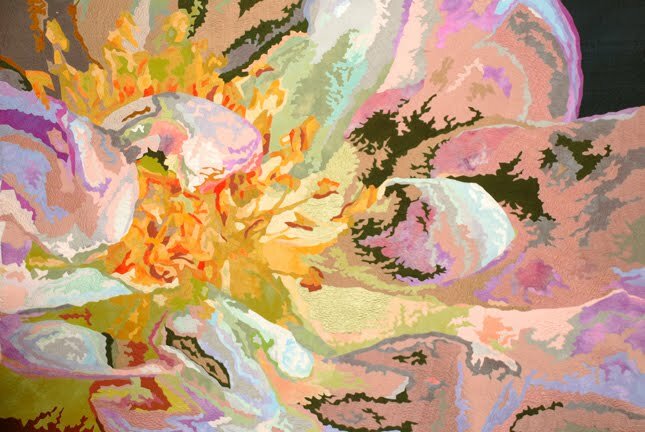 My show, Painting With Fiber: Florals, at ArtQuilt Gallery NYC is running about 3 more weeks and I received wonderful news the other day that my piece, Pink Rose I, has sold! How exciting is this? Hope I get more good news soon. We did a lot of window shopping. 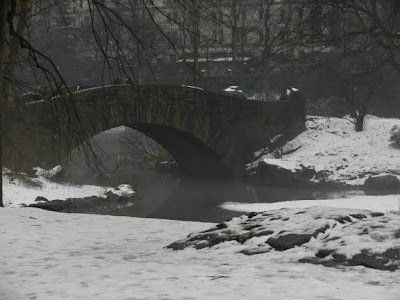 Unfortunately, I didn't photograph too many, since it was snowing or raining & we were trying to avoid getting too wet. We took this photograph of a silly window, mainly for our painting instructor, Phyllis Shafer. One of our assignments in class was to paint hundreds of stuffed animals (which I found uncomfortable since I like fewer objects in my composition). But Phyllis' job was to push us, so paint we did. 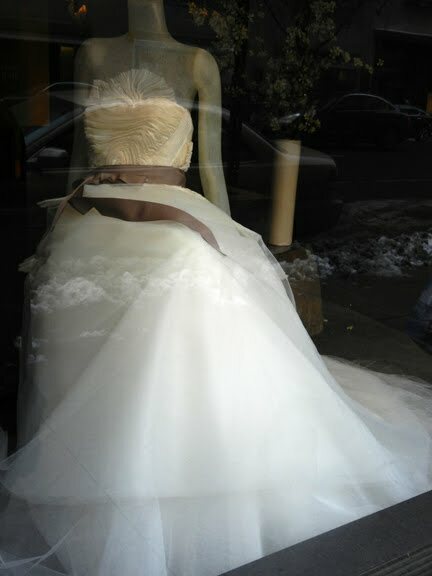 And this photograph of a stunning wedding gown by Vera Wang. I'm afraid the photo doesn't do this dress justice. You can see a slight reflection of the snow and traffic in the image. 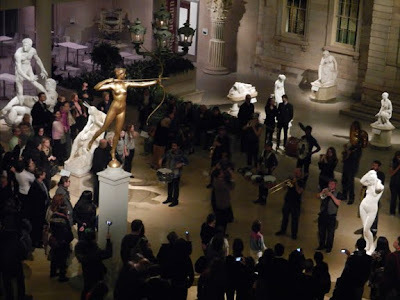 One of the most interesting things we experienced, other than walking the streets of New York or the idea of seeing all the paintings in person, was to be at the Metropolitan Friday & Saturday nights. There were fewer people and they were serving wine, which we passed on since we wanted to see art more than drink wine. Friday night we were so surprised to hear music coming from a great hall and learned it was a spontaneous band! What great fun that was! The sounds echoed throughout the halls! There were 3 drummers and wind instruments--even a tuba. This shot doesn't do it justice, but it was great fun! I especially liked the music they were playing, which was somewhat modern-- a little dissonant, quite energizing and exciting. One of the most important things on my list to do while in New York was to see as much art as possible. 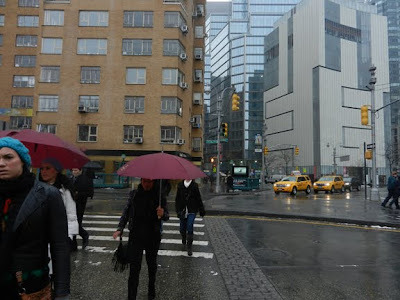 We had been advised to visit The Frick, The Whitney and of course, The Metropolitan. 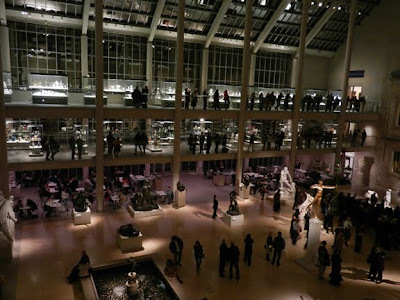 I had also wanted to see MOMA (unfortunately, de Kooning's show had just finished) and The Guggenheim. We also wanted to find Whole Foods (& found a Trader Joe's nearby) and, of course, The ArtQuilt Gallery. Finding the weather cold, but bearable, we walked everywhere. It was great fun to see New York that way. Each day we traveled on a different route, using 5th, 6th, 7th, Madison, etc. The only days that it was tough was Sat. when it snowed & Mon. when it rained. My waterproof shoes ended up not being waterproof, and Claudia, my painting buddy, needed some better shoes for the snow. We found some interesting shoes in Spanish shoe store--I think it was "Shapers" or something like that. They had the coolest wicker interior, but I didn't think to photograph it because we were so cold. 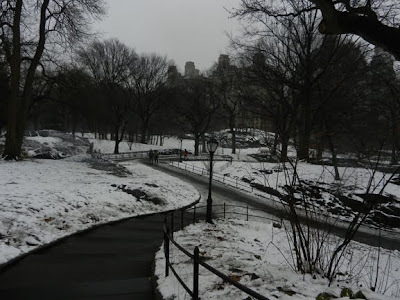 We also walked through Central Park several times as well.